Just like in humans, many dogs start to suffer from stiffness and soreness in their joints as they get older and begin to develop osteoarthritis. While there is no cure for this chronic condition, there are, however, many ways to manage it and ensure that your pet continues to enjoy a good quality of life. What is Arthritis and how does it Develop in dogs? Osteoarthritis – or simply arthritis, as it is more commonly known – occurs when the cartilage lining between joints starts to become thinner due to wear and tear, and the lubricating fluid within the joints also drops below normal levels. This leads to pain and instability when the joint is subjected to movement, such as when the dog is walking, running, jumping or even just getting up. Arthritis can be so painful that it becomes very debilitating for the dog, preventing normal mobility, and even causing loss of appetite and depression due to the pain and discomfort. There are many causes of arthritis, including damage due to injury to the joint, and growing defects, particularly in the elbow and hip joints. However, in many cases, arthritis develops simply through old age, particularly if the animal also starts to put on weight as well. This leads to a vicious cycle as the pain and discomfort discourages the dog from moving, and inactivity leads to more weight gain, causing more arthritic pain in the joints. Certain breeds are also more prone to developing arthritis, especially as they age. All the giant breeds – such as St Bernards, Mastiffs, Irish Wolfhounds, Great Danes – are prone simply because of the greater bulk they are carrying. Medium to large breeds are at higher risk as they tend to carry more weight and therefore are more likely to damage their joints. These include dogs like Labradors, German Shepherds and Collies. Even small dogs can get arthritis if they are very active and simply wear out their joints by the time they reach middle age. Young animals can also develop arthritis if they suffer an injury to a joint and it is left unstable and untreated. 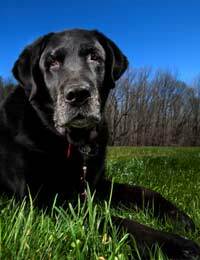 Can Arthritis in Dogs be Treated? Arthritis is a chronic, incurable condition. The best any medication can do is reduce the inflammation, pain and swelling in the affected joints – and in some cases, encourage re-growth and repair. Before any course of arthritis treatment is embarked upon, check and confirm that your pet actually does have arthritis and not another condition which can produce similar symptoms. These include bone infections, slipped discs and even cancer. In addition, once arthritis is diagnosed, it is often a good idea to administer a blood test to determine the kind of medication your dog can handle. Don’t forget that all drugs and medications have potential side-effects, so it is important you discuss all risks with your vet and be aware of any potential problems. What Medications are used to Treat Arthritis? Dogs with arthritis are most commonly treated with Non-Steroidal Anti-inflammatory Drugs (NSAIDs). These work by blocking the production of prostaglandins, which are chemicals produced by the body that cause inflammation. There are several types of NSAIDs available, so consult your vet to determine the best type to suit your dog. Use of NSAIDs is not without risks. They can be associated with gastrointestinal ulcers, stomach or intestinal bleeding and perforations in the stomach and intestinal lining, as well as causing toxicity in the liver and kidneys. The dogs most at risk of developing kidney problems while on NSAIDs are those on diuretic treatment, those who are dehydrated, and those who have pre-existing heart, kidney and/or liver problems. In particular, NSAIDs should never be taken in conjunction with other anti-inflammatory drugs, such as corticosteroids. Certain naturally-occurring plant substances can help to repair the damaged cartilage and stimulate joint fluid production. These usually have a long-lasting effect and are very beneficial when given at the beginning of a long, cold winter. Other natural alternatives include Glucosamine and Chondroitin supplements, which are added to the dog’s diet daily. Again, these can help to ease the discomfort of arthritis and encourage tissue repair and healing. Glucosamine plays a key role in cartilage production, as well as its maintenance and repair, while Chondroitin works to reduce inflammation and also help Glucosamine in its function. Another common supplement used for fighting arthritis is MSM (methylsulfonylmethane). This provides sulphur compounds which are believed to inhibit pain. There are a variety of different joint supplements on the market and they promise a host of benefits, from repairing damaged joint surfaces, ligaments, bony tissues and tendons to reducing tenderness, stiffness and pain and increasing lubrication in the joints. Different products will suit different dogs, so again consult your vet for the best match to your pet. In addition to specific drug treatments, arthritis can respond very well to changes in lifestyle and routine. So any medication should be used in conjunction with other therapies, such as acupuncture, massage and hydrotherapy (swimming in warm water) to help improve and maintain joint function.